The Sunshine Coast property market is healthier than it has ever been, so what is driving all the interest in our region’s housing? MWP looks at six factors that make the Coast so desirable to buyers, investors and renters.The Sunshine Coast property market is healthier than it has ever been, so what is driving all the interest in our region’s housing? MWP looks at six factors that make the Coast so desirable to buyers, investors and renters. WORDS: Roxanne McCarty-O’Kane. The Sunshine Coast property market is healthier than it has ever been, so what is driving all the interest in our region’s housing? MWP looks at six factors that make the Coast so desirable to buyers, investors and renters. WORDS: Roxanne McCarty-O’Kane. The auction clearance rates of properties going under the hammer on the Coast are rivalling the Sydney and Melbourne markets, the demand for properties is higher than ever and the days spent on market are the lowest they have been in years. So why is the region experiencing such ideal market conditions? According to Urban Developer, there are six factors that drive the country’s residential property markets: population growth, demographics, job creation, infrastructure, new residential supply, and lifestyle and amenity. Reading through the list, it is easy to see that the Coast ticks all of the boxes. Real Estate Industry Queensland CEO Antonia Mercorella says the economic fundamentals in the region are solid and support historical property price growth, which will continue throughout 2017. “The Sunshine Coast was the top-performing market in 2016. It is ideally located, on the coast and in close proximity to the third-largest capital city in Australia,” Mercorella says. “It has low unemployment, at just 4.7 per cent in January, which is below the Australian benchmark of 5.7 per cent in the same month, and there is a strong diversity in the buyer groups, with owner-occupiers, future retirees, local and interstate investors all contributing to increasing demand. “On top of that, the Sunshine Coast offers quality of life including modern healthcare facilities, good-rate education system and increasing employment opportunities with population growth. So, let’s break down the six key areas identified by Urban Developer to showcase why our property market is so strong now. With an estimated population of around 350,000, the Sunshine Coast takes out the title of fourth largest local government area in the country and renowned demographer Bernard Salt’s latest report The Activated City: Imagining the Sunshine Coast in 2040, predicts the region’s population will grow to 550,000 in the next 23 years. Greenfield sites at Aura and Palmview are already being transformed into property market magnets, creating housing for 50,000 and 12,000 people respectively. Australian Bureau of Statistics data shows in the 2015 financial year, the net interstate migration to Queensland was driven by residents from NSW, with 4862 people moving to the Coast. Mercorella says in the 2014 financial year, the Sunshine Coast accounted for 77 per cent of Queensland’s interstate migration, with 4474 (net) interstate migrants choosing to call the Sunshine Coast home, compared with a total of 5753 interstate migrants moving to Queensland. “A similar trend was noted in the 2015 financial year when the net interstate migration to Queensland reached 6417 residents, with 4732 residents moving to the Sunny Coast, representing about 74 per cent of total migration in the state,” she says. “The Sunshine Coast residential property market growth is sustainable as it has been driven by a moderate increase in population of about 25 per cent from the 2005 to 2015 financial years and steady economic growth of 30.9 per cent in the same period. Everywhere you look on the Sunshine Coast, you will find major development projects underway. All of these will provide construction jobs and ongoing employment opportunities in fields as varied as tourism and hospitality, medicine, aviation, and business. The newly opened $1.8 billion Sunshine Coast University Hospital has created an extra 12,000 new jobs and the training partnerships with the University of the Sunshine Coast and East Coast TAFE ensure young people who study in different medical fields will have an opportunity to remain in the region to begin their careers. The future Sunshine Coast Airport upgrade will create an estimated 5300 construction jobs and 2900 ongoing jobs. On the commercial front, SunCentral CEO John Knaggs says fostering economic growth is a key aim of the Maroochydore City Centre project, which will create more than 15,000 jobs and inject an estimated $4.4 billion into the local economy. Residential development sites like Aura and Palmview will also provide decades of work for thousands of tradespeople. AVID Property Group, which is developing stage one of Palmview (which is called Harmony), estimates more than 9000 jobs will be created by this estate alone. Mercorella says these projects strengthen the employment market, which is a key driver of housing demand. Sunshine Coast Councillor Jenny McKay says multiculturalism is alive and well on the Sunshine Coast, with 20 per cent of the population being born overseas, representing 156 countries, 45 faiths and 96 languages in the region. According to the Australian Bureau of Statistics 2014 figures, the average age of a Sunshine Coast resident is 42.8 years, 5.5 years older than the national average. Mercorella says the Coast has been one of Queensland’s best-kept secrets. “But those days are well behind us and it’s no surprise to anyone who knows this area why it is enormously popular with tourists and locals,” she says. Salt says the Coast will increasingly attract young tech-savvy entrepreneurs who are seeking out lifestyle locations to operate their businesses. There has been a wealth of both private and government investment in the region and projects will come to fruition for the next two decades and beyond. Infrastructure projects on the horizon include the Beerburrum to Nambour rail upgrade project, the Mooloolah River interchange connecting the Sunshine Motorway to the new Sunshine Coast University Hospital and the Bruce Highway upgrade from Pine River to Caloundra. Access to the Sunshine Coast is also set to become a lot easier for tourists and businesspeople, with the Sunshine Coast Airport expansion earmarked for completion in 2020. The 2450-metre-long runway will be capable of supporting 1.9 million passengers a year by 2020. AVID Property Group Queensland general manager Bruce Harper says these projects, along with the new Sunshine Coast University Hospital and the Maroochydore City Centre, strengthens economic development and job growth in the area. “As a result, residential property demand is surging,” he says. While capitals like Sydney and Melbourne are facing skyrocketing property prices, the release of land for several major residential developments across the Sunshine Coast will create more opportunities for home buyers and investors in the region. Harmony at Palmview will have 5000 homes constructed in the next decade and Aura will have 20,000 homes built over 30 years. 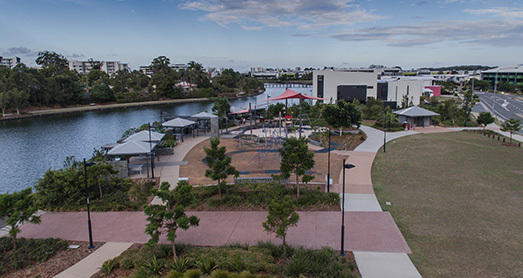 Bokarina Beach, which is located close to the Kawana health precinct, will also open up hundreds of home sites from mid-2017, as well as a dedicated town centre, tourist accommodation and a network of walking and cycling paths. Mercorella says REIQ statistics show house listings fell by 11.4 per cent in the Sunshine Coast statistical division for the 12 months to November 2016, a sign that this is a vendor’s market. “However, based on the economic fundamentals of the region, the Sunshine Coast residential property market is healthy and we are optimistic that the additional stock coming to the market will ease the demand pressure. This will ensure long-term market sustainability,” she says. Three Sunshine Coast beaches recently made it onto TripAdvisor’s Top 25 Australian Beaches list, the breath-taking views from the lush hinterland is a short drive away and despite its growing size, the Coast community still remains a close-knit one. The Coast was listed in another of Salt’s reports, Super Connected Lifestyle Locations, as a highly desired “lifestyle town” for people seeking the ideal work/life balance. “Ranging in size and location, the lifestyle town offers more affordable properties which often have scenic views or additional space to spare,” the report says.